Tulsa Sound Guitars (Sept 2014) Notes and news about art guitars and patent-pending prototypes; premium custom wood guitar knobs. First Guitars With Art Decals (Aug, Nov, Dec 2006) These are the first guitars with android originals LC art decals installed. 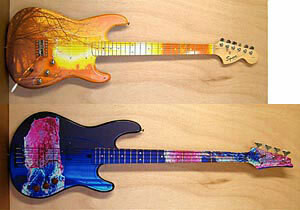 The first is a Fender Squier Stratocaster (tm), and the second is an Ibanez Cimar (tm) bass. Currently, the decals are still under development. 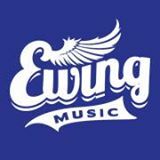 They will be made to cover the whole face of a guitar, by a rectangular decal of about 14 by 18 inches. They will be thin vinyl sheet with an adhesive backing, printed using a high-end six-color ink jet printer with pigmented ink. Covered with a clear (matte) plastic laminating sheet for mechanical protection, they are paper thin,. The colors will last for about three years in the sun. Indoor life would be about five years. However, the current top laminated film is rated for two years. They can be easily pealed off and repositioned before rolling out the air bubbles and adhering them firmly to a surface. It is possible that they can be removed later, with some effort, so that a guitar could be recustomized with new decals repeatedly. Because the top laminating file is stiffer than the usual van wrapping material, it cannot be rolled over the edges of the guitar easily if at all, and may be subject to peeling if that is tried. The most recent installation (the red, black and blue Ibanez Cimar bass above) limits the decal to the flat top surfaces of the guitar, including the simple curve of the forearm rest. click the link above for more details of the installation. Guitar Art Image Galleries (Dec 2006, March 2007) These galleries are digital ( using PhotoShop 7 (tm of Adobe Systems Inc)) simulations of android originals artwork applied to guitars. They contain about 50 different images total, with some duplicates on different guitar body styles. Guitars used for templates include the Washburn Billy Taylor (tm) model electric guitar. I'm currently investigating use of decals to apply the images to a guitar. Baritone Ukelele (also spelled ukulele, 5 July 2006) For those of us with physical and/or psychiatric disabilities, it's a good thing to find some peace of mind. Making music can do that, providing a profound sense of relaxation. For these uses, the baritone ukelele is both inexpensive and has distinct advantages. Tablature for Thumbs (5 July 2006) If one takes up making music with say, a baritone ukelele, when either too old or disabled to wrap one's fingers around the neck without pain, or unable to finger chords and notes on the frets without hitting more than one string per finger, there is tablature for thumbs. That's right, you play with your thumbs. Among the things you can play that way are: Amazing Grace, Streets of Laredo, House of the Rising Sun, Scarborough Fair, Shenandoah, Greensleeves, O God Our Help in Ages Past, The Beatles' Blackbird, and Ashokan Farewell. Some can be played on just one string. How to Pick a Guitar String (7 May 2006) What size string is best to use for a particular note on a particular guitar? Here are some sample charts, and the method to make charts for your own guitar, favorite strings and style of play. Show You My UnStrat (7 May 2006) How to dehornicate your Strat (tm Fender) and love it all the more. So far, the design of guitar bodies is mostly conceptual. My modifications of a Squier Bullet Special (Show You My UnStrat) brought its weight down to a bit over five pounds. I did take the neck from an Austin guitar and make a stripped body for it. The combo weighs less than 3 lb 13 ounces, including strap, pick and a movable single-coil pickup wired directly to the jack. It makes very little sound acoustically. But if you put it down on a table top, the sound gets a lot bigger. All it needs to hear it without an amp is a sound board. The toughest thing was making the tight-fitting wood neck socket in the body. More Art The former introduction page of the web site www.android-originals.com. This contains much of the artwork from which this Guitar Art was developed. I bought my first guitar ever in May 2005. I had literally dreamed of playing one for some time. I do not have much musical talent, and have tried many times to learn to play instruments. Usually I fail to learn or keep up with it. Since I was not sure that I could actually learn to play a guitar, I asked the salesman for the cheapest electric guitar in the store of decent quality. I bought a Fender Squier Bullet Special", which I am slowly customizing to suit my (dis)abilities (see Show You My Fender" below). It turns out that I can play a guitar, if only with my thumbs, one string at a time. I can safely say that I'm slightly better than Dave Lister on deep space mining vessel Red Dwarf. But I do not anticipate playing any gigs in the forseeable future (translation - not in this lifetime). Local Links - Some of the local Tulsa music scene.